Using upsell technique you can propose additional products to your customers and increase overall sales. Upsell by email application created for Shopify platform allows you to send follow-up emails on schedule, which allows you to stay in touch with your customers. Let’s have a look at this app more closely. 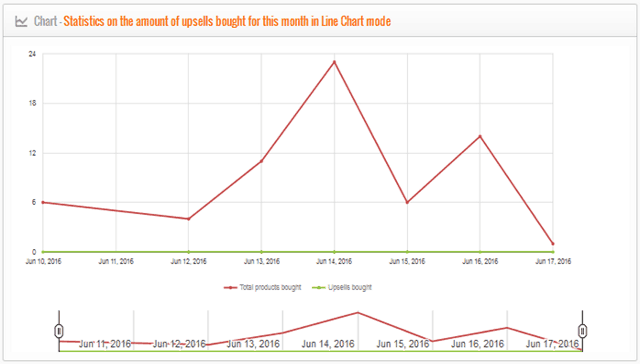 After app installation you can see its main dashboard with a list of stats for the selected period. There is general info about stats for today, current month and for all time of app usage. Looks rather attractive and at the bottom of this page you can find a chart with the amount of upsells. Of course you can select any period you need for further analysis. Offers category allows you to create various offers to your customers and propose additional products based on the content of their orders. 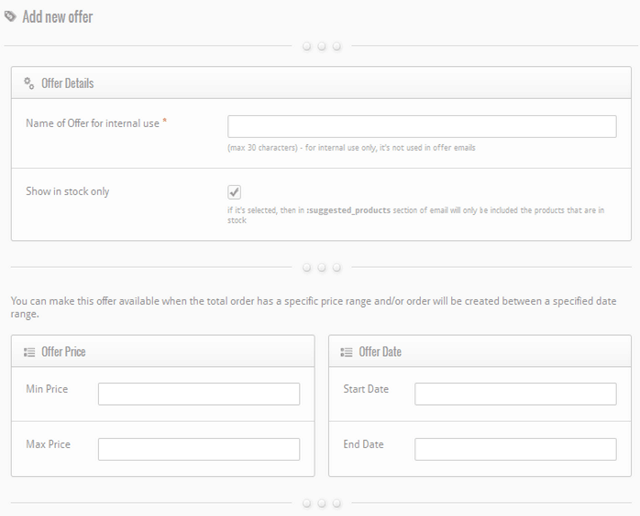 In order to add new offer you need to click Add New Offer, where you can describe offer details. 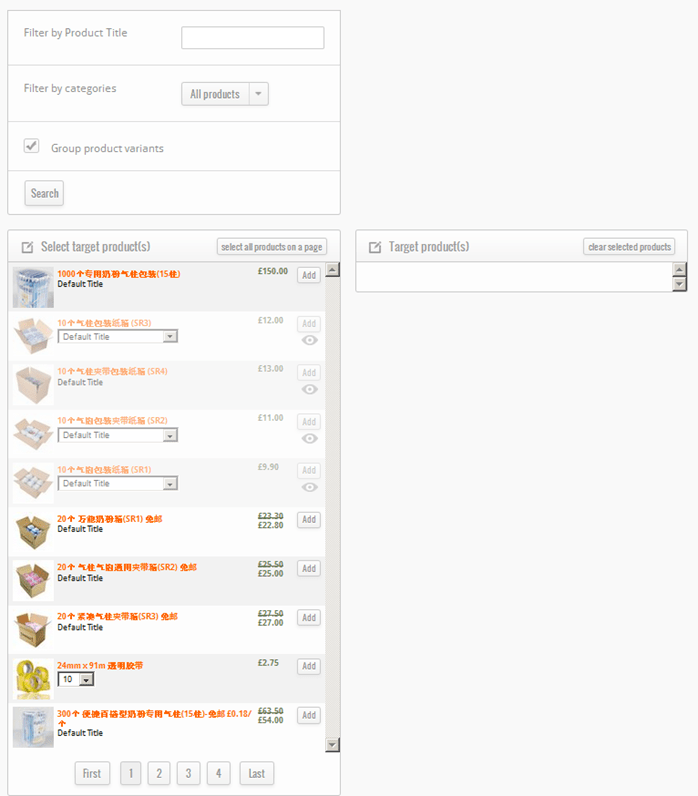 Ability to show products offers which are in stock only. 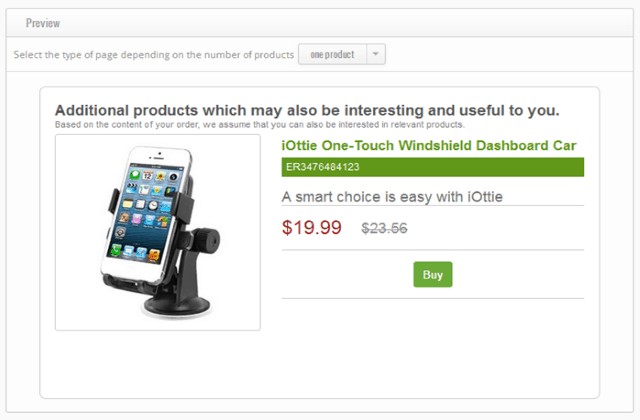 These products will be selected for emails to your customers. Below you can specify the products for which that offer will be proposed. If on the customer’s order there is one or some of the products chosen below, then this offer will be proposed to the customer. If you want that offer is always proposed to customer, i.e. regardless of what he has bought, then you don’t need to specify target products at all. 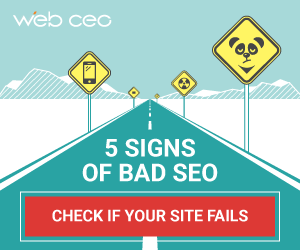 At the bottom of this page you can specify the products which will be proposed on that offer. If in the customer’s order will be one or some products chosen above, then selected below products will be included into email. Templates category is used for specific email creation from various countries. Let’s have a look how to add new template. Customer’s country. This template will be associated with customers from the country, which you have selected. Do not send notification if the customer has ordered later. Set up sending time after the order (immediately or with a delay in days). Do not include last suggested products which have been sent to the same customer during selected days. 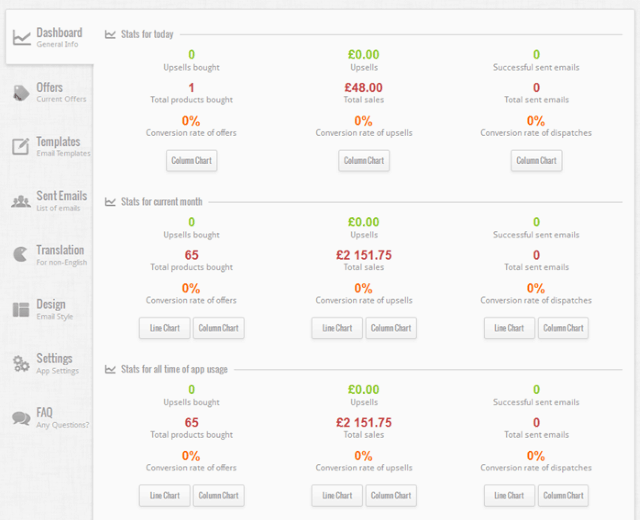 Then you can adjust email data: subject, sender name, choose email for replies. 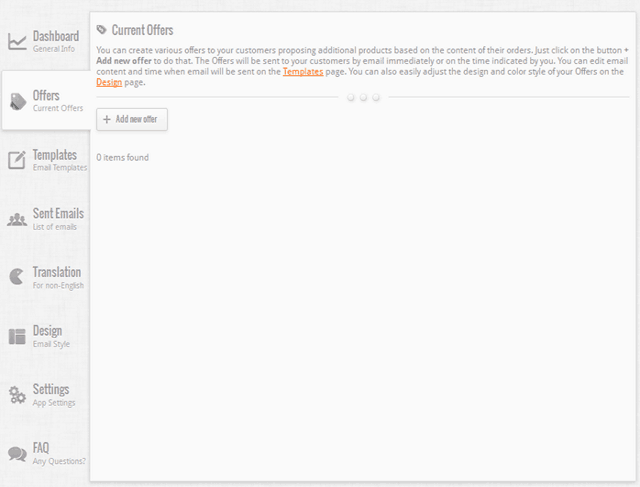 You can create a template, which will be used to inform your customers. 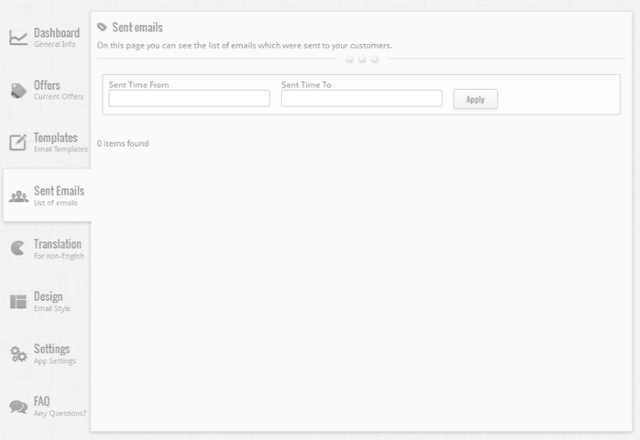 On this category you can see a list of emails which were sent to your customers with the ability to filter date. 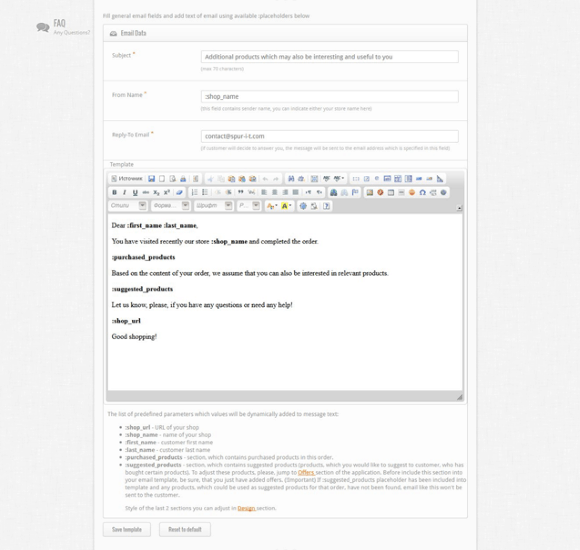 This category allows you to edit phrases, which will be used in emails. 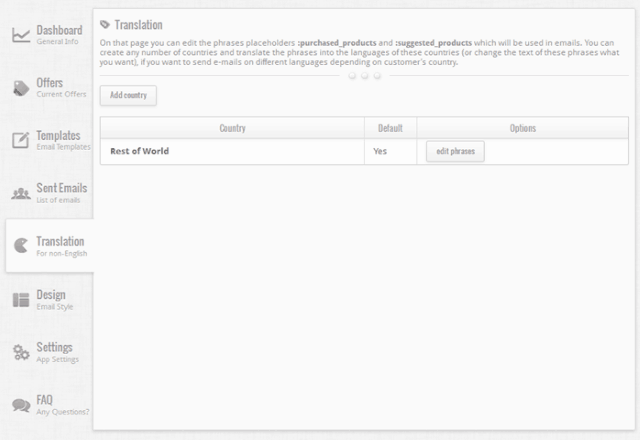 You can create any number of countries and translate the phrases into the languages of these countries (or change the text of these phrases what you want), if you want to send e-mails on different languages depending on customer’s country. And it’s very convenient that you can preview all changes in the real time. 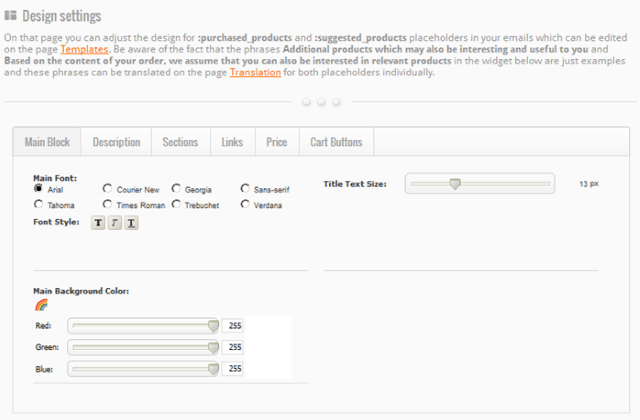 On this page you can configure timezone for correct calculation of statistics used inside of your webstore.